Yay, it's the weekend! It's been a busy week for me and the family and I'm enjoying some downtime before the twins arrive back home after their sleepover at Grandma's. I miss them terribly when they're gone; but, the quiet is nice too. We announced our winner from the Poster Print Giveaway last night, so if you haven't already done so, check to see who it is and maybe send them a note of congratulations. 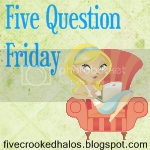 If you haven't joined into the Five Question Friday fun, hop on over to My Little Life to link up and answer your own five questions. 1. Do you have any nicknames and if so how did it come about? Yes, I have several. My friend in Calgary calls me "Step". Which came about when we were in highschool and she went to call me Steph and it came out wrong. We had a good laugh, and it's just kinda stuck ever since. My two BFF's and I refer to each other as "Stooge". Again, a name that stems from highschool. The three of us were in the school band and we all play clarinet. We also all worked at Canadian Tire, had the same morals and values among other things. We became the 3 Stooges and so we fondly call each other Stooge when addressing each other! 2. What is your birth order amongst your siblings? I'm the best, the first born of course! I have one sibling, a younger brother who was born 5 years after me. 3. In a movie of your life, who would play your significant other? Hmm, I'm not really sure. If I had to pick an actor, I guess it would be Channing Tatum. He's about the same height and colouring of my hubby. 4. What is currently your favorite song? Coming Home by New Kids on the Block. 5. Are you saving your money for anything right now? Big or small purchase? Sadly, we are not saving our money right now. Like most people these days the economic recession has been difficult for us, and so any money we have goes to digging our way back to a comfortable place. Well, there you have it! I hope to see you around the hop. It is soo hard to save right now. It seems like everytime you get ahead something comes up to put you back, huh?